A modified version of this commentary was published in the print edition of the Eastern Shore News in Virginia on November 19, 2016. 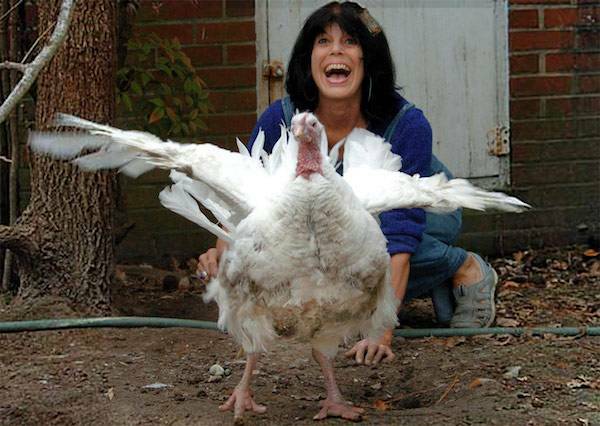 Just as Christianity substitutes bread and wine for human and animal sacrifice in the Christian Eucharist, the communal thanksgiving in which Jesus reputedly chose vegetarian foods to symbolize his body and blood, so the tofu turkey and other animal-free foods are replacing the traditional corpse in many homes. Few people yearn for the bygone days of bloody altars and struggling victims in places of worship or in “kitchens covered with blood and filled with the cries of creatures expiring in tortures,” as the 18th-century poet Alexander Pope wrote of the lesser known side of Jane Austen’s polished society. Such scenes no longer appeal to most people, so how can they be justified out of sight and sound? Yet even today, what is done to animals for food takes place in much of the world out in the open and unprotested. Either the ritual of animal food production is so visible a part of the culture as to render the animals “hidden” in familiarity, or it takes place in featureless buildings and “processing plants,” rendering the animals invisible that way. A woman who worked for a turkey company in England said of the birds at the slaughterhouse that when the coffee break sirens sounded, the kill crew dropped everything and left the turkeys hanging upside down from the conveyer belts until they came back from their break. No one thought about the birds, she said. Linzey argues that the central event of the incarnation in Christianity is God’s affirmation of “all flesh, both human and animal.” Could Christianity ever come to respect “all flesh,” not in false ceremonies of compassion, but in fact? Why can’t the symbolism in the image of animals grouped in the Nativity scene be extended to a theology that places all creatures within the realm of the Golden Rule? Christianity’s inclusion of animals in the Nativity scene doesn’t even appear in the canonical New Testament gospels, but was added centuries later. Are such images doomed to being mere symbols and tokens of a reality we do not really want except as a tease, and not so much from a desire to protect the ideal from pollution by the real, but to protect the real from being “spoiled” by the ideal? Ironically, in the case of animal rights, the “idealists” are the ones who keep trying to focus society’s attention on the actual lives and individuality of animals, the realm in which Life manifests itself, versus those who intone formalistically about Life and Species and invoke platitudes of Apology to and Respect for the Animal, while treating actual flesh and blood creatures in ways no different from the ways of those who profess no respect for the earth or for animals at all. Does Religion Help or Hinder Animal Liberation? Because the role of religion is controversial within the animal advocacy movement, our 2017 Conscious Eating Conference in Berkeley, California, on Saturday March 11th, is devoting a significant part of the program to the role of religion, asking: How does religion help or hinder the cause of animal liberation? Among the perspectives presented will be Kim Socha’s view in Animal Liberation and Atheism, that “the very concept of religion is inherently antithetical to animal liberation.” In my own non-theological opinion, if God can become flesh, then flesh can become fruit. With or without religion, we can share a flesh-free table lavished with the fruits of the Earth, making every day a day to celebrate.